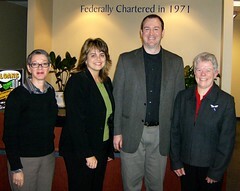 I had the great pleasure of meeting Virginia (Ginny) Brady (far right), Linda Bourgeois (far left), and Jody Carpenter of UFirst Federal Credit Union in Plattsburgh, New York, yesterday. I first met Ginny in Spokane in September, where she was invited to speak to the Washington Credit Union League’s annual convention because of her experience blogging. To the best of my knowledge, Ginny is the first member of a credit union board of directors to blog. Her blog, the Boardcast, has just celebrated its one year anniversary. Her blog covers a range of issues pertinent to members from the Board’s perspective. She is a pioneer because she is using this technology to inform and converse with members. As a Board member, who is acting to guide the credit union in the members’ best interests, I think having a Board blog is a great thing. How better to represent the membership than to inform them what is going on, and invite their feedback? All credit union boards, and even management teams, ought to consider blogging with their members. This entry was posted on October 26, 2007 at 1:11 am and is filed under Blogging, Our peeps, Travels, World 2.0. You can follow any responses to this entry through the RSS 2.0 feed. You can leave a response, or trackback from your own site. You bring up some good points Morriss. Throughout the member/owner/customer debate and discussions about the credit union movement, the role of the board is seldom discussed. You don’t often hear about the all-volunteer boards who are democratically elected by members to be their representatives, nor the significance of the board’s role. Exactly, Jeffry! Nicely stated! The other thing which I would wager virtually no credit union member understands is how much work the Board does on their behalf, and all without any monetary compensation. So Board blogging is a win-win situation. The Board gets to let everyone know what they are doing and the issues they are wrestling with, and the members get to add in their two cents. Seems like a perfect fit to me! That’s part of the reason I am so excited about Ginny’s groundbreaking work, and hope it remains a successful model for other Boards and CUs to follow suit. Jeffry, you’re right – part of my goal in blogging is to provide a forum for dialogue with members. Right now I think I may be getting more attention from outside our membership but that’s OK. I believe that The Boardcast may just be the first of many “blogs of the future” that are spearheaded by boards, we’ll see. Morriss’s visit has given me fresh ideas to find new ways to encourage participation in the Boardcast. His generosity in sharing his expertise provides an example of a true professional. It was wonderful of him to have taken the time from his busy schedule to visit us. What luck to have met him in Spokane! The blogging community in general is a terrific resource.